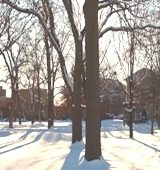 Beloit College received a A.
Washington Monthly's ranking of 43 out of 224 of Affordable Elite Colleges - Overall Rank was a major contributor to this grade. "Pink hair and pierced faces" are not uncommon at funky and free-thinking Beloit College, where the college motto is "Invent Yourself" and "jocks and freaks" more or less peacefully coexist in a "very demanding" and intimate academic atmosphere. Student Symposium occurs each spring: For an entire day, students and faculty ditch classes to view student projects displayed all across campus." What are the top 3 reasons someone should attend Beloit College? If you're interested in not being a cookie-cutter student, this is the place for you. If you want to continue being a college athlete without the competitive environment of a Division One school. What is a typical Beloit College student like? Describe the type of person that should attend Beloit College. There is no typical student! We are all quirky and unique, from the lacrosse bros to the seasoned LARP-ers. [Encourages] intellectual curiosity and personal initiative by giving students freedom to explore. A First-Year Initiatives program brings all Beloit's freshmen together through interdisciplinary seminars and orientation programs. Beloit takes a well-rounded approach to the admissions game. The Beloit College community is diverse and noted for its passionate engagement with ideas and the world. Its 1250 students are from nearly every state, the District of Columbia, and 40 nations. Twenty-one percent of its students are domestic minorities or students from countries other than the United States. No more than ten percent of a graduating class is represented in any one of Beloit's majors. 97% of Beloit's 105 full-time faculty members hold a Ph.D. or the highest degree in their field. Teaching is the faculty's highest priority but all professors are active scholars and artists. Many are leaders in educational reform. Professors serve as mentors, guides, and partners on research projects and academic work. A strong tradition of student-teacher collaboration contributes to the college's lively intellectual community. Beloit offers more than fifty majors, more than thirty minors, and a number of dual-degree and preprofessional programs. A flexible curriculum, grounded in rigorous study encourages independent research, fieldwork, and collaboration with peers and professors. Coursework is interdisciplinary, experiential, and global in scope. The average class size is 15 students; Beloit's student-to-faculty ratio is 11:1. The college's academic facilities include the internationally recognized Logan Museum of Anthropology, the Wright Museum of Art, a state of the art performing arts complex and research labs equipped with advanced technology in the new LEED Certified Center for the Sciences. Beloit offers more than thirty international programs, dozens of domestic study programs, and hundreds of internships and field study programs. What are the top 3 things that students do for fun at Beloit College? Bizarro Beloit - dress up like your favorite professor, read middle school poetry at c-haus, and eat their favorite throwback foods at kindergarten day. The average student pays $24,423 for tuition, fees, and other expenses, after grants and scholarships. Total stated tuition is $40,970, in-state and on-campus, before financial aid. Learn more about financial aid at http://www.beloit.edu/prospective/afford/. Estimate the net price for you at http://www.beloit.edu/prospective/npcalc.php. The typical (median) early career salary of Beloit College graduates is $38,900, according to Payscale. Beloit College participates in the NCAA Division III for college athletics. Want more info about Beloit College? Get free advice from education experts and Noodle community members.